Take a look at Wine Industry Advisor's coverage from our 14th Annual Sustainable WInegrowing Field Day, including a great video featuring a hands-on workshop on inspecting nursery vine health lead by Laura Breyer of Breyer IPM Vineyard Service. 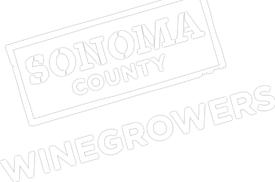 Friday, August 8th the Sonoma County Winegrowers held their 14th annual field day with a focus on sustainable winegrowing. The event filled the Agricultural Pavilion at Santa Rosa Junior College’s Shone Farm for a day of learning and networking. It’s been 6 months since the Sonoma County Winegrowers announced their ambitious goal of being 100% sustainable in 5 years, and the agenda for this year’s field day reflected the scope and commitment to that goal. The speaker topics included not only presentations directly related to vineyard practices like Red Blotch disease updates, endangered species and pesticides, and quality control of nursery vines, but also issues related to the broader scope of sustainability….